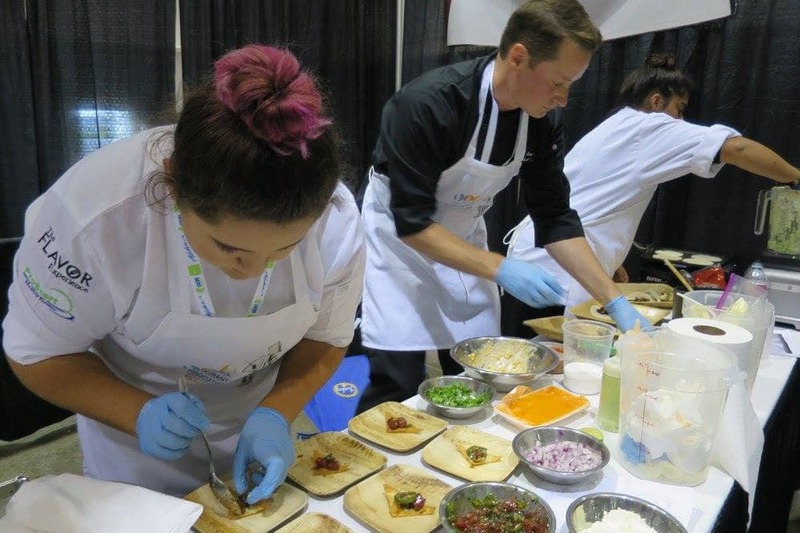 Restaurant brands faced-off in the sixth annual Culinary Clash, a fundraising event to benefit the California Restaurant Association Foundation (CRAF), presented by Coca-Cola. 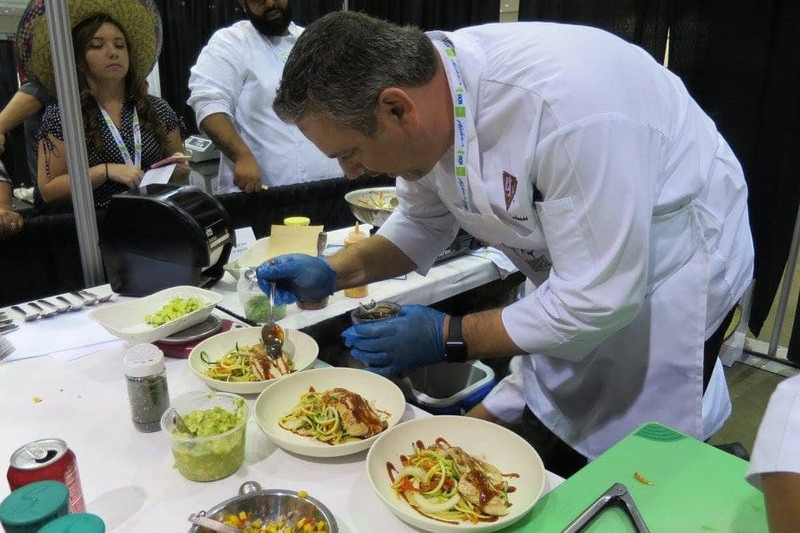 The battle was held on August 27 in conjunction with the Western Foodservice & Hospitality Expo at the Los Angeles Convention Center. 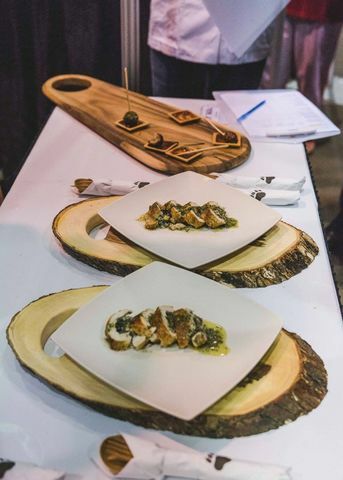 Culinary teams, comprised of a restaurant executive, a corporate chef and a ProStart high school student, had 30 minutes and two butane burners to create an amuse bouche and an entrée. More pictures can be found here. Amuse Bouche – “Jive Turkey Pop”. Using the KitchenAid Stand Mixer, Team Black Bear Diner made bite-sized balls from Foster Farms Ground Turkey, ground pork, egg, Italian seasoning, panko breadcrumbs, kosher salt, ground black pepper and chopped parsley; skewer them with a Bamboo Studio 4.5-inch Black Willow Pick and deep fry to a golden brown. Pops were served with cranberry jalapeño chutney made with sautéed shallots, garlic, jalapeños and dried cranberries that were blended with Simply Orange Juice in the KitchenAid blender then transferred back to the sauté pan where Simply Cranberry Juice, kosher salt, Cajun seasoning, brown sugar and Black Bear Diner’s private label ketchup were added. Served on Bamboo Studio’s Reusable Mini-Plate. 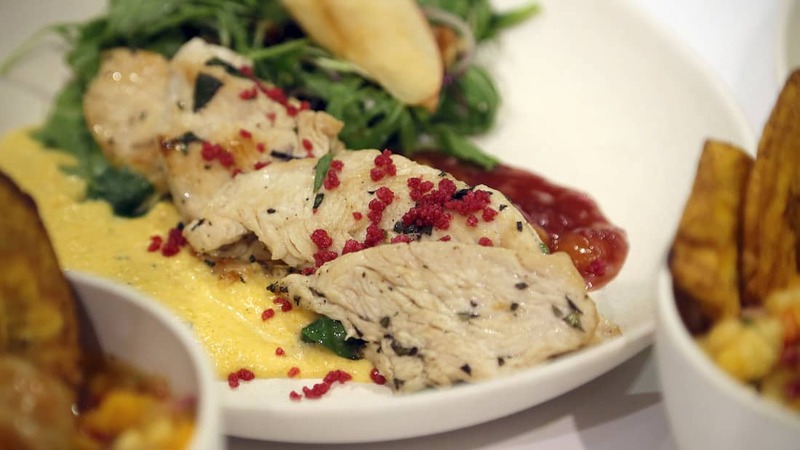 Entrée – “Rockin’ Ricotta Turkey Roll”. Team Black Bear Diner stuffed butterflied Foster Farm Turkey Tenderloins with sautéed garlic and shallots, ricotta cheese, parmesan cheese, spinach, chopped parsley, salt and pepper; then roll it up and pan fry until golden brown. Sliced, rolled turkey is place on Bamboo Studio’s Bambooware Reusable Dinnerware and topped with chimichurri made from parsley, garlic, dried oregano, dried red chilies, Simply Orange Juice, olive oil, kosher salt, ground black pepper and lemon juice was whirled in the KitchenAid Blender. 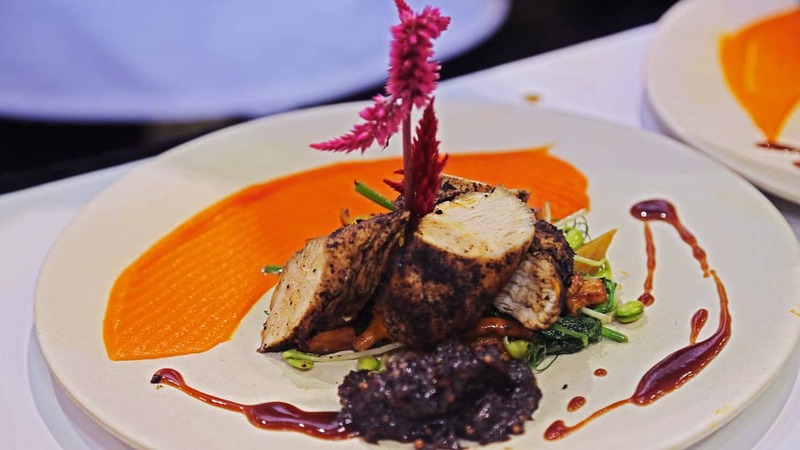 Entrée – “Thanksgiving Sushi” using Foster Farms Turkey Tenderloin, yam spears, and FreshPoint baby beets sautéed in butter, rolled in stuffing and soy paper sushi style over a Cherry Coke cranberry reduction, topped with bulls blood micro greens and a puree of turnip. Notes – Team Urban Plates used Cherry Coke and Simply Orange Juice in the cranberry reduction, the KitchenAid Stand Mixer for the flourless cake batter and the KitchenAid Blender for the turnip puree and to blend the cranberry reduction. Amuse Bouche – Cherry Coke and tequila glazed shrimp with pineapple mango salsa and fried plantains. Notes – The butternut squash puree was created using the KitchenAid Blender. Notes – Team Lawry’s Prime Rib used the Cherry Coke in the mostarda with dried cherries, mustard seed, dry mustard powder and sugar. 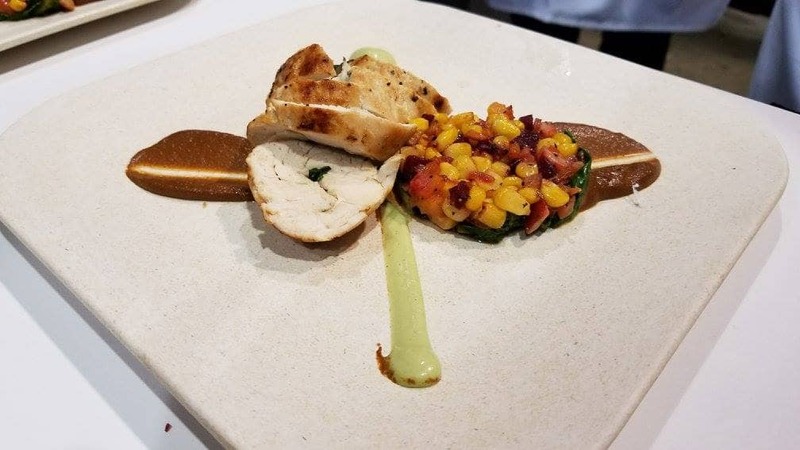 They used the KitchenAid Blender three times: once for the Yuzu cucumber marinade for the scallops, once for the carrot puree and again for the mostarda. As for the FreshPoint secret ingredient, they blanched and peeled the baby beets and used them in the vegetable garnish for the turkey. Making the most of the secret ingredient, they also used the beet greens in the garnish as well. Entrée – Blackened ground Foster Frams Turkey patty on top of a cheese-stuffed pupusa, glazed with Coca Cola sweet sauce, and topped with sautéed baby root vegetables. Served with charred corn relish. Notes – Team Hard Rock Café took home the KitchenAid Commercial Champ award by using both the mixer and the blender. They ground the Foster Farms Turkey Tenderloins in the blender and mixed the pupusa dough in the KitchenAid Stand Mixer. Entrée – “Cokieyaki”. A stir-fry of three different FreshPoint baby beets, carrots, yellow onion, red bell peppers, zucchini, yellow squash mixed with a Coca-Cola based sauce. Topped with seared turkey tenderloin, rice noodles, green onions and drizzled with a Sriracha Coca-Cola sauce. 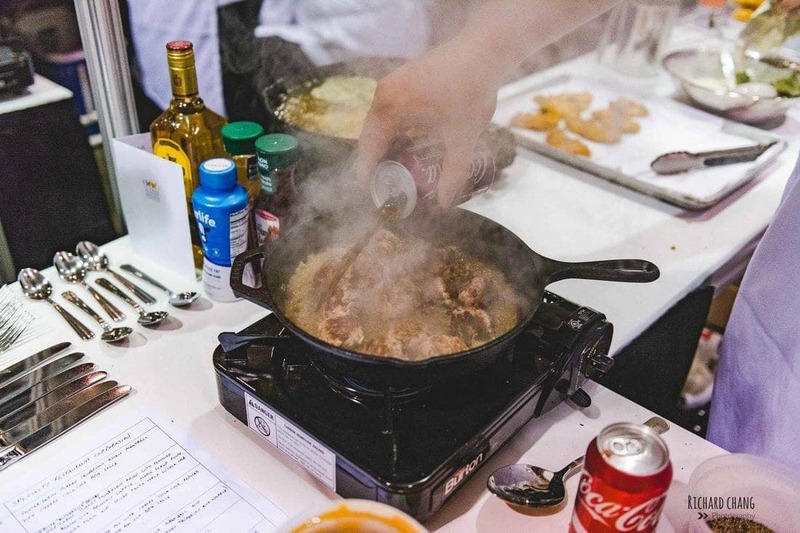 Notes – The house-made Cokieyaki sauce was blended in the KitchenAid Blender. Amuse Bouche – “Foster Farms Turkey Tenderloin Meatballs with a Cherry Coke Asian BBQ Sauce”. Using the KitchenAid Stand Mixer and the grinding attachment, Team SRC ground the Foster Farms Turkey Tenderloin. Then they took the ground turkey tenderloin and folded in garlic, ginger, cilantro, scallion, lime zest, Thai basil, Serrano pepper, lime juice, Fanta Orange and did a brunoise of the FreshPoint beets, mixing it all, using the KitchenAid Stand Mixer, with one egg and panko bread crumbs. The team formed the mixture into 1.5-ounce meatballs, searing them in a cast iron pan. They “deglazed” the pan with Cherry Coke, let it reduce by half, then used that as the base for the Asian BBQ sauce. Entrée – Fairlife Milk “Buttermilk” Brined Fried Foster Farms Turkey Tenderloin and Waffles, with Brûléed Maple Fluff, braised FreshPoint beet greens, Fanta Orange foam, Cherry Coke sweet and spicy “syrup”, crispy battered beet greens, pickled beets and pickled Serrano peppers. Amuse Bouche – “Poke Nachos”. 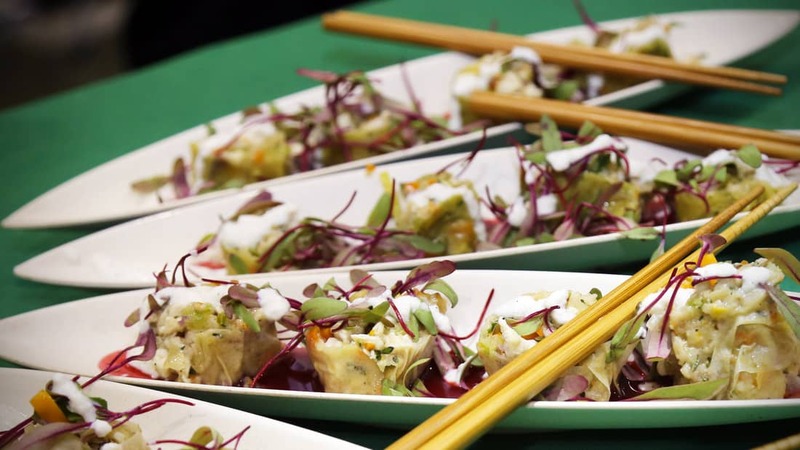 This crowd-pleasing bite was made with Ahi tuna marinated in soy sauce, chili sesame oil, and ginger served on a crispy wonton chip topped with green onions, masago, nori, spicy mayo and fresh avocado crema. Entrée – “Foster Farms Turkey Carnitas Street Tacos”. Crispy turkey mixed with a Coca-Cola, Mexican spice and chili glaze on a warm corn tortilla. Served with a fresh avocado salsa and a side of deconstructed elote. 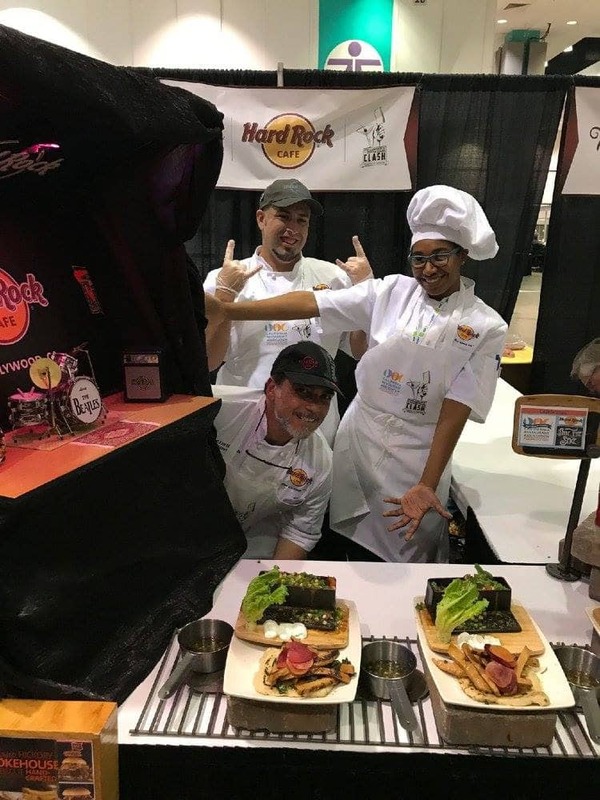 Notes – Team Yard House was represented by a ProStart teacher and two ProStart students!